In Japanese, sometimes you have words that repeat themselves, they're the same thing said twice, like: hitobito 人々, iroiro 色々, betsubetsu 別々, marumaru 丸々, dandan 段々, hibi 日々, tsugitsugi 次々, itaitashii 痛々しい and so on. When such thing happens, it's called reduplication, or choujou 重畳, the process of creating "reduplicative words," jougo 畳語, and it's not specific of the Japanese language. English has it too. In this article I'll explain how it works in Japanese, and common effects it has on the meaning of words. 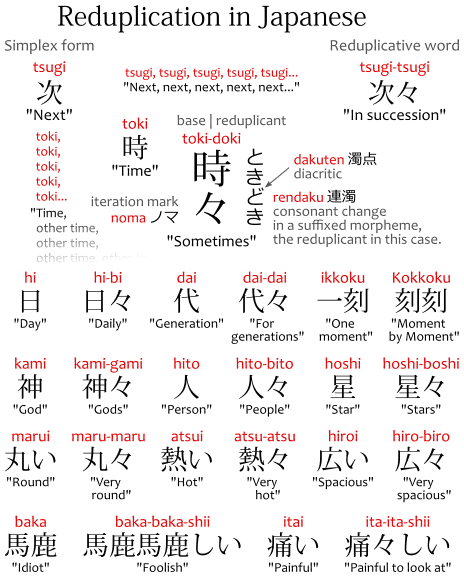 The reduplication in words works like this: you have a word, like tsugi つぎ, "next," and when you say it twice: tsugi-tsugi つぎつぎ, it means "in succession," something rather different instead. It doesn't mean "next next" as we'd expect. This happens because tsugi つぎ and tsugi-tsugi つぎつぎ are two different words that share the same morpheme. A morpheme is like a piece of a word. The word tsugi has the morpheme tsugi once, while the word tsugi-tsugi has the morpheme tsugi twice. Linguistically, the two parts of tsugi-tsugi, the first tsugi and the second tsugi, are called base and reduplicant. When you remove the reduplicant of a reduplicative word, you get its simplex form. equals tsugi, "next," the simplex form. Note that there's a technical difference between words that feature reduplication and words that just feature repetition of syllables. But honestly that doesn't matter very much as far as this article is concerned since the word we'll be talking about share the same properties anyway. See the References for the details. 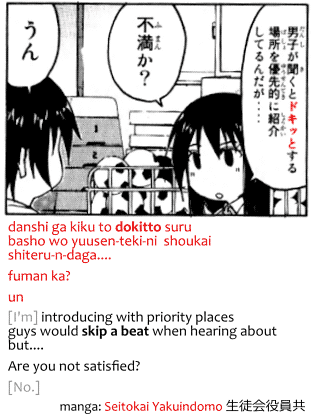 Since reduplication is found in a ton of Japanese words, and reduplicating the morpheme means you must write the kanji you just wrote all over again, BY HAND, the Japanese people figured "yeah, nah, ain't nobody got time fo' dat," and decided to use a symbol instead when reduplication occurred in a word. is the same as tsugi-tsugi 次次. is the same as naka-naka 中中. The day before before yesterday. Sometimes the base is composed of more than one kanji (and/or morpheme), so the reduplicant is longer too. Although it's not considered valid anymore since the post-war orthographic reforms, the number of kurikaeshi's for the reduplicant could then match the number of kanji in the base. For each person. To each person. Note that although reduplication is common in Japanese words, triplication, the same thing thrice, is not. Sometimes a single kanji represents a single morpheme, sometimes more than a single morpheme, and, in some very weird cases, a single kanji represents the same morpheme twice. The examples above are usually not written with kanji, though, specially not one kanji. They're normally written with kana. So although it's possible for them to be written like that, that doesn't mean they will be written like that. If a reduplicated word is written by writing a same kanji twice, then it'd make sense to think that writing that kanji only once is how you'd write the simplex form. Although sugasugashii is a word, suga is not. How can that be? Furthermore, the readings of the kanji of that word, 清, don't even include suga! That is: there's no other word in Japanese where 清 is read as suga. What is the world is going on here?! By reduplicating this suga into suga-suga the meaning became emphasized. And the -shii ending makes it refer to what something feels like. So maybe sugasugashii means it feels "refreshing" because whatever problem was there has passed and gone away. Anyway, this suga isn't used in Japanese anymore, but sugasugashii stuck. That's why the word sugasugashii still exists but suga does not. Since the word sugasugashii exists, it feels bad for it not to have kanji. So someone slapped a "matching character" on it, an ateji 当て字, which was 清, for its "clear" meaning matched the "refreshing" meaning of the word. There are other iteration marks in Japanese besides 々, some of which can be used to express reduplication in words written without kanji, with just kana. But those aren't really common so I won't talk about them. Mentioning them is enough I guess. Reduplication doesn't always reduplicate the simplex form exactly (full reduplication). Sometimes a change in pronunciation occurs (partial reduplication). The first and most common case is called rendaku 連濁, a change in pronunciation where the first syllable of a suffixed morpheme can get a diacritic, a dakuten ゛ mark (or handakuten ゜). This rendaku effect is by no means a reduplication-only thing. It happens in words without reduplication too. For example, the word for "God of Death" is shinigami 死神, not shini-kami. Which morphemes get rendaku'd varies. In particular, mimetic words, which frequently repeat themselves, do not feature rendaku in their repeated parts. Example: karikari かりかり, *scratching,* doesn't become karigari. Furthermore, it's a word that features rendaku, not the combination of morphemes or the repetition of a certain kanji. That is, although rare, you can have two different words spelled the same way, homographs, both featuring reduplication, but one pronounced with rendaku (partial reduplication) and the other without (full duplication). This would be really confusing, wouldn't it? To make things clearer, although the spellings 様々 and 様様 should be interchangeable for both words, it's common to spell the latter without kurikaeshi. I.e. : samazama 様々 and samasama 様様. The second case is called sokuonbin 促音便, a change in pronunciation where two sequential hard syllables of different morphemes in the same word get melded together (consonant gemination) into a double consonant instead. Such "double consonants" are represented in Japanese by a small tsu っ, and in romaji by literally spelling the consonant twice. Now, moving to the main part of the article: the common effects of reduplication. Japanese words that repeat themselves always exhibit one sort of another of multiplicity in their meanings. After all, if you say one thing once, you imply one of it, but when you say it twice, you imply you have two (or more) of it. Plurals, collectives of their simplex forms. Parallels or alternatives based on the simplex forms. Emphasized versions of the simplex forms. Sequences or continuity according to the frequency of the simplex forms. Let's start with Japanese reduplicative plurals. But this needs a bit of a warning. The way how plurals work in Japanese is that most words do not have plural forms. Combined with the lack of definite and indefinite articles, a single random noun, like neko 猫, "cat," can refer to one cat, a random cat, the cat, the cats, some cats, or even all cats, like, in general, etc. depending on the sentence. So, for most words, you don't really need do anything to get the plural version because plurality depends on context. Furthermore, you can't just reduplicate a random word to make it plural. You can't say neko-neko 猫々, for example, to mean "cats." That word doesn't exist. Anyway, back to words that do exist. Some words that feature reduplication are plural versions of their simplex forms. This does happen. Yes. But they aren't just "plurals," they're more like "groups," they describe collectives, many of something, usually implying various of something, too. A god vs. many, various gods. A person vs. many, various people. Person (related to something, somewhere.) vs. people. Above we have words that refer to "groups" of stuff. For example, when one says kamigami, they aren't referring to two random gods in particular, they're probably referring to all the gods of the Olympus, or all Japanese gods,"or "going against the gods" in general—heresy!—"the battle of the gods," etc. Likewise, hitobito aren't two persons, they are the many people (of somewhere, for example, like a village). And wareware doesn't refer to two of "me," it probably refers to the group I represent: my company, organization, institution, etc. This form is also common with geographic words. A country vs. many, various countries. An island vs. many, various islands. A mountain vs. many, various mountains. A tree vs. many, various trees. Star vs. many, various stars. The many, various countries of Europe. To have won and survived numerous battles. The nooks of. The corners of. Search EVERY SINGLE LAST CORNER of this room!! [I'll tear] you into pieces!!! In Japanese, there are some words which feature a rather weird effect when they are reduplicated. They become plurals, sure, sort of, but the way they end up being used are as adjectives or adverbs rather than nouns. This happens in words such as iroiro 色々 and betsubetsu 別々. And it happens because the simplex forms means one "type" of thing, rather than one "thing" of one type. When you reduplicate, the collective is then the various "types" of things, rather than various things of one type. The first case, for alternatives, is a bit complicated because the simplex forms are complicated to begin with. Above we have the reduplicative samazama as adjective for the tools. It means "various types" or "various kinds." The simplex form of samazama is the word sama 様. But wait... sama? The honorific suffix like san, chan, or kun? What? How do you get "various types" from that?! It doesn't even have an actual meaning, just a nuance! Well, no. The suffix sama is a different sama, not the one we're talking about here. The word sama 様 also means how something looks like, appears like. It's found in words like arisama 有様, "the way something is," literally "appearance of being." So let's say you have a bunch of tools. This tool looks one way, that's looks this sama. This tool looks another way, it looks this other sama. So here we have tools that look this sama and that sama, that's two sama way-of-looking, samazama. Alright, so the simplex form of that is more simple, I mean, it's iro 色, "color." So why does it not mean "colors"? What's up with this "all sorts of"? That makes no sense! The word iro means "color," not "sort," what is this madness!!! You can find it in the following yojijukugo 四字熟語, "four-character idiom:"
So, likewise, iroiro 色々 is the collective of "sorts." The word sore それ means "that." Imagine there's a bunch of things in a room. You point to one, you say sore, "that." Then the next one, sore, "that." The next: sore. And sore. And sore. And that, that, that. In other words, you're referring to "each" of them individually, in parallel, rather than collectively. Everybody has their own role. Everything has its own role. The word betsu 別 means "different," or "separate" of something else. So betsubetsu 別々 implies we have two (or more) betsu's. For example, if this guy is acting betsu, "separate," of this other guy, who's acting betsu, "separate," of this third guy, and so on. They're acting betsubetsu of each other, separately. The toilet is in a different room. The bath is in a different room. The bath and and the toilet are separate. With tokorodokoro 所々 we're implying there's a tokoro 所, "spot," "place," here, a tokoro there, a tokoro over there, and they all have something in common. For example, if you slip on a banana peel and drop a bucket of paint, now there's paint "everywhere," there's paint tokorodokoro. The paint is in multiple places at once. The next common effect reduplication has is of making things intense. Intenser. Importanter. Very-er. As the saying says, when you say something twice it's because it's important. (e.g. to lift something) as if it were light. (by extension, to do something difficult) as if it were easy. [He] fattened [to the point he looked] very rotund. [He] lifted [it] up [as if it were] very light. The to と particle above was used to adverbalize reduplicative words that are perceivable. In contrast, the suffix -shii ～しい adjectivizes them. Look: -shii ～しい ends in -i ～い, so it makes -i adjectives. What comes out of reduplicating something and adding -shii ～しい on top of it can vary wildly. Of course, they are somewhat, somehow related to their simplex forms, but their usage can be pretty different. Or what you feel, think, etc. Single male. dokushin dansei 独身男性. Someone that looks heroic, dignified. (e.g a protagonist of a Hollywood action movie, Superhero comic book, the good guy. Hercules, Superman, Wonder Woman, etc.). That seems to prove its worth. Example: talking in a way that's too informal, invading your personal space—PERSONAL SPACE!! !—touching, etc. Since a very long time. To fight fair and proudly. To fight fair and square. The last effect of reduplication in words is that of continuity. That is, the implication that something is going on, and on, and on, and on, and on, and on, and on, and on, and on, and on, and on, and on, and on, and on, and on, and on, and on, and on, and on, and on, and on, and on, and on, and on, and on, and on, and on, and on, and on, and on, and on, and on, and on, and on, and on, and on, and on. Surely, nothing goes on infinitely, forever, but stuff can go on indefinitely, for kamisama knows how long. In Japanese, reduplication of certain words can imply something happened continually for a unspecified amount of time, or refer specifically to the frequency by which it happened rather than for how long exactly. hi 日, hi 日, hi 日, hi 日, hi 日, hi 日, hi 日, hi 日, hi 日, hi 日, hi 日, hi 日, hi 日, hi 日. And hibi 日々 implies it. So you could, for example, you can study "every single day," mainichi, but you make progress "daily, continuously," hibi. Likewise, there are scientific experiments being done "every single day," mainichi, but scientific advances are done "daily, continously," hibi. Next. Next. Next. Next. Next. In succession. The next one, then the next, over and over. Grade. Grade. Grade. Grade. Grade. Time. Time. Time. Time. Time. Occasion. Occasion. Occasion. Occasion. Occasion. Generation. Generation. Generation. Generation. Generation. To return. To return. To return. To return. To return. Increase. Increase. Increase. Increase. Increase. Turn. Turn. Turn. Turn. Turn. Turn. Lastly, the same way as above, reduplication in mimetic words such as onomatopoeia naturally implies a continued idea or sound. For example, wakuwaku わくわく, a mimetic reduplicative word for "excitement," implies that one waku = one excitement, and thus wakuwakuwakuwakuwakuwakuwakuwakuwaku means a continuous state of excitement. 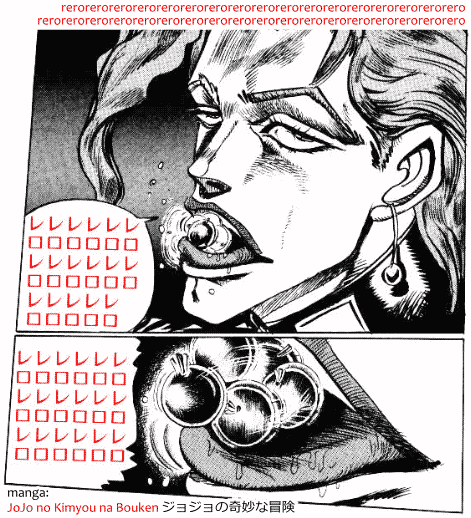 More tangibly, dokidoki ドキドキ is an onomatopoeia for the *thump-thump* of the heart. But surely the heart doesn't just thump just twice and stops there. It keeps thumping. So dokidokidokidokidokidokidokidoki, etc. Conversely, when an ideophone that's usually reduplicative appears only in its simplex form, it would emphasize it's just a single instance. For example, a single doki would mean "a single thump," rather than continuous thumping. By extension, dokitto ドキっと, "with a (single) thump," is used when you experience a strong emotion, something exciting, like love at first sight, or scary, maybe, by emphasizing that lone, stronger thump. In English, the equivalent is ironically "to have your heart skip a beat," rather than to have a beat like in Japanese. That is, both expressions refer to the same thing: it's such an outstanding single thump the next one gets delayed, messing the rhythm, as if it were skipped, but they sound like they're opposites. A study where native Japanese speakers were asked to describe what many reduplicative words mean, and what they think made up reduplicative words (such as neko-neko) would mean if they were real words. Since the focus of this article was show the common effects of reduplication in Japanese, I didn't bother to make sure whether a word is really reduplicative from a technical standpoint or merely features repetition of syllables. So long as the effects were similar for me it's enough. The simplex waka 若 is not a word on its own. Only the adjective wakai 若い is. Likewise this is just a prefix prefixed onto itself. This isn't a word you'd use normally. It's only used in stories. It could very much be like saying "a long, long time ago." The "long" is repeated; "long-long" isn't a word. But then again, it's not like Japanese lacks punctuation. You could write mukashi, mukashi 昔、昔. Okay, maybe not. You could write mukashi mukashi 昔　昔, with a space. So maybe it is a reduplicative word, after all. dokidoki ドキドキ, wakuwaku わくわく, etc. Practically all mimetic words that repeat themselves don't really have simplex forms. I mean, if wakuwaku has a reduplicant, -waku, then you should be able to remove it to get waku, the simplex, just like you can do with any other reduplicative word. But waku doesn't mean anything at all alone. Nobody says just one waku to mean anything related to "excitement." It only makes sense when it's wakuwaku, or more waku. I'm no linguist, but if my interpretation is correct, the simplex form of a reduplicative word need not to be an actual word, just a morpheme. If that's the case, then it's probably valid too. Since a morpheme is something you can't divide further, and you can totally divide wakuwaku into two waku. Just like you can divide dokidoki into two doki. If that's not the case then what I'm saying is all wrong and a number of these aren't reduplicative words. Not that it matters though, because in the end the observed effects of repeating parts of words are the same. Even if wakuwaku isn't a reduplicative word, it still gives the impression of continuity and frequency, just like hibi 日々, a word that's certainly reduplicative. While I see the difference between Mainichi 毎日 and Hibi 日々 the former does have a reduplication of its own, which seems identical to Hibi in meaning. MainichiMainichi is used quite often, in the first episode of Gurren Lagann this is the first thing Simon says. 毎日毎日 seems to be the intensified version of 毎日. Since 毎日 isn't identical to 日々, 毎日毎日 shouldn't be identical to 日々 either. There's a difference in saying digging is a thing Simon does every single day without fail, mainichi-mainichi, and saying digging is part of what Simon does daily, hibi.